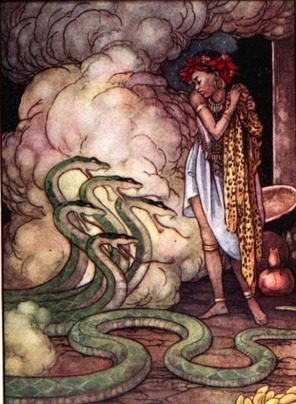 “A great snake with five heads was closed beside her.” Illustration by Helen Jacobs, published in Native Fairy Tales of South Africa by Ethel L. McPherson (1919), George G. Harrap & Company. Read South African folk tales from playwright Sanni Metelerkamp, and folklorists like Andrew Lang and The Brothers Grimm. Browse full list of South African folk tales now. About: South African folk tales serve to unite communities, and preserve societal ties and ideologies. In this way, they are fluid and never static. Oral storytelling in the culture is a pathway to pride, to identity and to groundedness in a country that fears losing its roots to Western influence. As stories began to fade from the firelight, author and playwright, Sanni Metelerkamp, wrote down the popular tales every child in the region knew, so they could be preserved for future generations. Andrew Lang and The Brothers Grimm have contributed collections of South African fairy tales to their books as well, but on the whole, South African folk tales remain an important and primarily oral tradition to this day. South African folk tales reflect the realities, often harsh, of the African landscape. Tales are rooted in nature elements and the animal kingdom. At the heart of the folklore is the necessity to communicate the need for generosity and cooperation between people. To impart the values of a community, was the main purpose of storytelling as it drew people together and strengthened bonds. These stories for children reflect common and worldwide indigenous themes of creation and origin myths, tales of death and regeneration, and the connection between the spiritual and physical world.